You want to plug your computer into your 4K TV? Then you'll need to know how to use a 4K TV with a PC. While the physical process is as simple as plugging in your PC to a TV via an HDMI cable, that won't deliver the best experience without a little tinkering. There are still multiple inputs and standards to be aware of when attempting the connection. Televisions have come a long way - what used to be a convoluted process, has led to just needing a HDMI port on both the TV and the video card - but there's a little more to it. The image you actually get on your TV is where the issues arise. The three biggest factors lie in Input Lag, Overscan, and Chroma Subsampling. 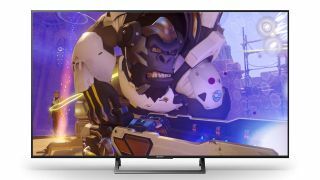 If you're looking for a 4K TV that allows you to compensate for all these factors, then check out our guide to the best gaming TVs available in 2018, or scope out a bargain in our guide to the best Cyber Monday 4K TV deals. And if you want to know how to optimize your set-up, check out the guide below. We've also got a guide to using a 4K monitor as your main TV, right at the bottom of the feature. And here are the best PC games currently available. Input lag - what is it, and how do you get rid of it? Input Lag is when there is a delay between the television or monitor receiving a signal and it being displayed on the screen. This isn’t so much a problem when doing menial chores like web-browsing or word processing, but when gaming is required, the precision needed doesn’t cut it. Imagine playing Fortnite and moving the cursor to fire at a target, but there is delay. That delay could be the difference between victory or defeat. Thankfully, some TVs have the option of a Game mode. Game Mode allows the TV to compensate for input lag by disabling features on the TV that are insignificant to gaming. This alleviates the majority of the problem, assuming that your TV has the option. Generally speaking, LG TV sets are the best at reducing input lag, with most of their TVs now offering a hugely respectable 21ms of latency (even with HDR enabled, which demands more performance from the set), which is class-leading. You basically won't notice it with that kind of performance. Overscan - what is it, and how do you get rid of it? Another issue is that of Overscan. When connecting a PC to a 4K TV, the desktop might extend further than the edges of the TV. Try hitting the Start Button on the Windows taskbar when it isn’t on screen. That is never easy. New TVs are better suited for this problem than others. By pressing the Menu button on your remote, you can navigate to something known as Picture Size. This allows you to change the format of the image from 16:9, 4:3, Zoom, Auto Wide, or Screen Fit. Screen Fit is what we would want to select from the menu and the PC image should fit into place. Now you will get the entire desktop fitting to the dimensions of the 4K TV. Chroma subsampling - what is it and how do you optimize it? The only time Chroma Subsampling is important is when connecting a PC to a 4K television. This is because, with most applications, there won’t be a visual difference. Most TV sets support 4:4:4 or 4:2:0. What this means for computing is that the signal the TV receives from the PC will have more luminescence and color data when connecting to a TV that allows for 4:4:4. If you don’t want to miss anything in the image, it is vital that your TV supports this format. It isn’t noticeable in other subsets such as watching movies or TV shows, but for computing, 4:4:4 offers a better picture. When connecting a PC to a 4K TV, there can be problems that make it sub-optimal. The solutions for most newer TVs is to pay attention to the input mode and change the picture size. By changing the input on a TV to Game Mode and making the Screen Fit within the frame of the TV. Two of the biggest issues involving using a 4K TV as a PC monitor have been taken care of. To make sure you are getting a 4:4:4 chroma setting on your 4K TV, you can look at the ports in back of the TV set and make sure the HDMI ports you are connecting to are labeled HDMI 2.2. What are the best 4K TVs for PC gaming? If you are looking for a moderately priced 4K TV to use as a PC monitor, the Sony KD43X720E supports 1080p and 4K, and 4:4:4 chroma. It has low input lag that makes it suited for PC usage. If you want the best and money is no issue, then look no further than the LG OLED55C8PUA. This OLED television has one of the best images in its class, it suits the needs of a PC monitor by providing chroma 4:4:4, and it has great response times. For more, check out our best 4K TVs for gaming guide. It used to be a bigger ordeal to connect a PC to a TV, but invention of HDMI and 4K TV’s, it is becoming simple. There continues to be a few issues to be aware of when making the connection, but those are easy fixes. For some users it might be more practical just to stick with a PC monitor as there are strides being made in that sector as well. Great PC visuals on a 4K TV is just a simple HDMI cable away. Can you use a 4K monitor as a 4K TV? Yes you can, although PC monitors tend to come in smaller sizes than most 4K TV sets. There are multiple ways to simulate the experience of a 4K TV on a computer monitor. One solution would be subscribing to multiple content providers. Services like Netflix, Hulu, HBO Go, and others have made unplugging from a traditional TV service easier than ever. Another technological leap to look forward to are that PC monitors are continuing to evolve. One of the hottest features on 4K TVs is known as HDR (High Dynamic Range). This brings a color range to video sources that old TVs just aren’t capable of. With PC monitors adapting this format, the differences continue to blur. Video card manufacturer Nvidia has been promoting their own changes to the how PC monitors function. They have developed a gaming display that provides HDR and law latency 4K gaming. They are known as Nvidia G-Sync displays and they might be the closest a PC monitor has come to providing the needs of a TV viewer. This is a screen that will excel not only in gaming, but offers the luxuries that 4K TV owners have been enjoying. The biggest difference between a monitor and 4K TV is a TV tuner. This is how cable companies pass the cable signal through the TV so they can access cable channels. A computer monitor doesn’t come with a tuner in most cases. Here's out guide to the best gaming monitors, if you need it.